If you had to list the pros and cons of owning telecom stocks it might go something like this. On the plus side you are typically treaty to rather stodgy dividend yields backed up by monopolistic underlying businesses. In terms of the dividend the plus point manifests itself differently depending on your investment style. For the income seekers I don’t think I need to spell out the attraction of 5%+ yields in the post-financial crisis world of super low interest rates. For the total return guys starting off with a fat dividend yield means less legwork is needed in terms of future earnings growth. As for the cons there are two that immediately come to mind. The first is that maintaining and expanding all of the underlying infrastructure is incredibly capital intensive, a point which tends to weigh on free cash flow. The second is that these businesses aren’t particularly sticky in terms of pricing power and customer retention, especially when it comes to providing standalone wireless services. With that in mind I think AT&T (NYSE: T) stands out as the best-in-class option. In terms of the ‘pros’ it ticks off the dividend box with a current yield of around 5.4% that is covered comfortably by free cash flow. In terms of the ‘cons’, well, it seems to do a reasonable job of generating excess cash relative to intensive capital expenditure requirements. It is by no means perfect on this score – having to spend over $20 billion per year on capital expenditure just to keep revenue static isn’t exactly ideal – but it sill manages to convert a healthy chunk of cash from operations into free cash flow each year. In addition I’m a big supporter of the company’s diversification strategy, namely the acquisition of DirecTV and the pending one of Time Warner (NYSE: TWX). In the case of the latter you’re looking at a bunch of very attractive capital light assets such as Turner Broadcasting (e.g. CNN, Cartoon Network), HBO and Warner Brothers. All-in-all it’s a money spinner that currently churns out around $4.5 billion in annual cash from operations versus annual capital expenditure requirements of only $400 million. As for DirecTV, the major advantage comes from being able to cross-sell and bundle TV with wireless, internet and fixed-line services. Ultimately it represents an easy way to tackle the pricing power and customer retention issue mentioned above. As far as AT&T is concerned the end result of all this M&A activity, assuming the Time Warner deal happens of course, is that the portion of earnings from wireless operations will decrease from well over 60% to around 45%. For the reasons set out above I think that’s generally a good thing for the business and its shareholders. That said, the cost of the existing asset intensive underlying business plus one, possibly two, mega-merger(s) is being borne directly by the balance sheet. 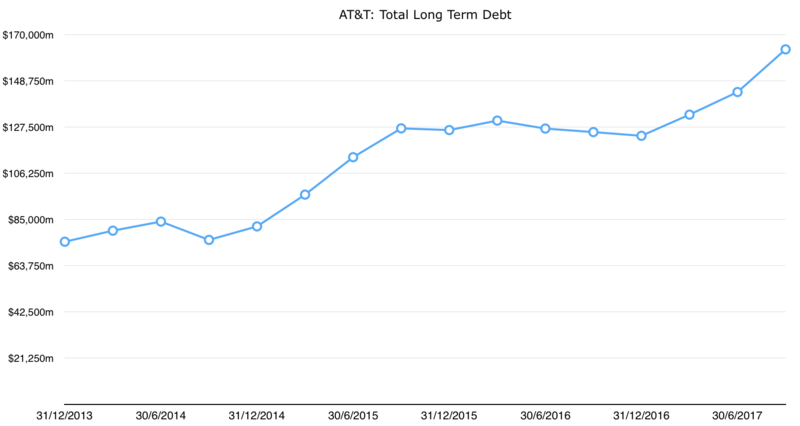 The last time I wrote about AT&T stock back in September 2016 it was sporting total outstanding debt of around $125 billion. If it goes through the cash portion of the Time Warner deal will clock in at approximately $42.5 billion, and will be paid for by heaping yet more debt onto AT&T’s balance sheet. That’s before factoring in the $20 billion or so in net debt that is currently sitting on Time Warner’s books. The rest of the deal will be paid for by issuing fresh AT&T stock. 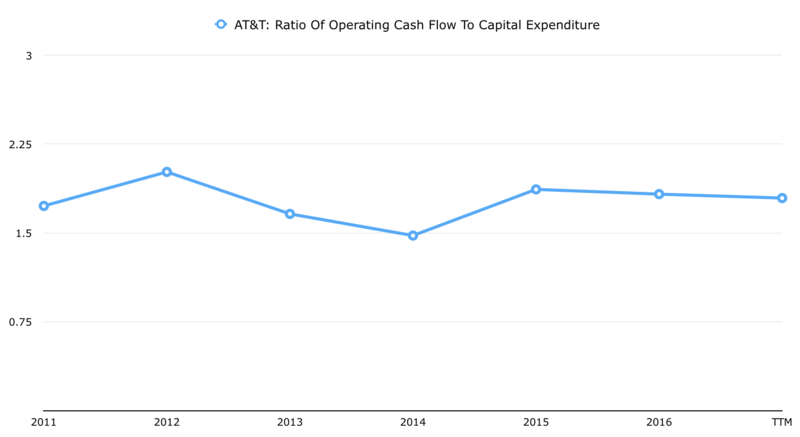 Given the importance of the dividend to AT&T shareholders it’s worth taking another look at how all of this is going to add up on a cash flow basis. As it stands the business is currently throwing off $39.5 billion per annum in cash from operations. Out of that we’re then looking at around $21 billion in terms of annual capital expenditure, which therefore gives us around $18.5 billion in annual post-capex free cash flow. Of that figure we’ve got to fund our two other big cash outflow items: dividends and debt repayment. Based on the trailing twelve month dividend of $1.96 per share and 6.18 billion shares in issue the former is running at around $12 billion in cash flow terms. In theory that then leaves a surplus of $6.5 billion that can go toward paying down debt. Okay, so that’s AT&T as it is right now, but what about after we factor in the proposed Time Warner deal? Well, as mentioned above Time Warner is currently throwing off around $4.5 billion in annual cash from operations and it’s annual capital expenditure bill is around 10% of that. Let’s call it an additional $4 billion in annual free cash flow to add to AT&T’s coffers. However, the flip side to the deal, at least in the short to medium term, is all that extra debt. Overall we’re looking at a ballpark figure of around $185 billion gross debt in total. Unfortunately for us all that debt adds up to a rather large annual interest bill. Let’s say the extra debt ascribed to the Time Warner deal – i.e. $42.5 billion – attracts interest of between 4%-5%. That takes a roughly $2 billion chunk out of the $4 billion in free cash flow that Time Warner brings to the table. Still, even after taking that into account we could expect to see total free cash flow rising to around the $21 billion mark in the first year post-deal. Here’s where it get’s a bit tricky due to the other part of the deal: the equity portion. Based on AT&T’s current share price of $36.50 we’re looking at around 1.1 billion new shares being issued to Time Warner shareholders. If we assume the enlarged AT&T keeps the same dividend in per-share terms we would be looking at an extra $2.15 billion in cash outflow. Or put another way the total dividend commitment would increase to around $14.25 billion in the first full year. Capital expenditure would also rise slightly though it’s a tiny fraction relative to the legacy operations. Running the $21 billion in annual free cash flow against the enlarged dividend commitment leaves us around $6.75 billion left over for debt reduction. The big prize, though, will come once the company makes sufficient headway in paying that gargantuan debt load down. If the Time Warner deal goes through AT&T will be spending roughly $8.5 billion a year on interest payments in total. Imagine that cash ending up as free cash flow instead, perhaps going towards increased dividends or share repurchases instead of bondholders’ pockets. Attacking that debt pile is not just a necessity for financial health, it’s also an easy source of future earnings and free cash flow growth. This is where the $6.75 billion in post-dividend free cash flow comes in. It’s a smaller figure than I’d like to see, but it’s probably enough to alleviate concerns regarding the safety of the current dividend while leaving a meaningful amount to go after the bigger prize of debt reduction.